Book Island | The books I'd have if stranded on a desert island! No one ever said life was easy. But Ponyboy is pretty sure that he’s got things figured out. He knows that he can count on his brothers, Darry and Sodapop. And he knows that he can count on his friends—true friends who would do anything for him, like Johnny and Two-Bit. But not on much else besides trouble with the Socs, a vicious gang of rich kids whose idea of a good time is beating up on “greasers” like Ponyboy. At least he knows what to expect—until the night someone takes things too far. The Outsiders is a dramatic and enduring work of fiction that laid the groundwork for the YA genre. S. E. Hinton’s classic story of a boy who finds himself on the outskirts of regular society remains as powerful today as it was the day it was first published. This is the first novel I ever read more than once. To date, I think I’ve read The Outsiders four times. Unlike many others, I found the movie to be a disappointment. I read the book multiple times before the film adaptation made it to the big screen. The story remained in tact, sure, but the actors portraying the characters resembled little of the images my mind conjured. These were young Hollywood pretty boys up on the screen. In my mind, these were boys with scars on their faces, the rough life etched into their pores. The book itself is a fantastic story. Sure, this is a YA novel, but anybody can enjoy the tale S. E. Hinton has woven. If all you know of this book is the movie, you really need to grab a copy and discover one of the great stories that transcends generations and eras. At 180 pages, it’s a great way to kill a few hours. I’m sharing this interview because Jazz Baby happens to be one of my all-time favorite books! 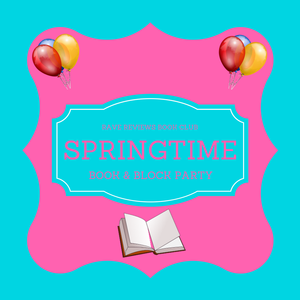 Hi and WELCOME to Rave Reviews Book Club’s BOOK & BLOG BLOCK PARTY at THE INDIE SPOT! Location: MICHIGAN. CONGRATULATIONS TO THE WINNERS: Mae Clair, Rob Kimbrell, Mary Schmidt, and Jerry Marquardt. I decided to have a little fun with this Book & Blog Block Party stop. In the years since Jazz Baby first saw publication, some readers have been curious as to what happened to Emily Ann “Baby” Teegarten. Did she ever make it to New York? Were her dreams of singing jazz professionally ever realized? Did she find success? Well, presented here, is an interview with Baby Teegarten, which takes place ten years after the novel ends. This is meant to be a glimpse into the life our protagonist may have created for herself. This is an incredible collection of dark, haunting, short stories by some skillful storytellers. And the fact that all the writers collaborating here are indie authors. They do the indie world proud. There are monsters and vampires and those who dabble in witchcraft. The darkness seeps from each page, spooking and daring the reader to continue on. There’s a recipe for chicken soup that can conjure a demon—but once that demon appears, it cannot return to hell without taking a soul along. A person sentenced to death for the charge of practicing witchcraft. But who ie the innocent one here, accused or accuser? A bloody murderer meets his own demise, and readers will be surprised how it all plays out. The skill level here is well above average. Some of these tales verge on brilliance. Beem Weeks, my favorite indie author, contributed a fantastic piece called Demons. This dark tale centers on two young girls who find the courage to camp out on Halloween night in an abandoned farmhouse that thirty years earlier had been the site of a brutal mass murder. With Ouija board in hand, the two girls begin their search for the ghosts of the family that had died in the house. What they found was something even more sinister than the departed looking for revenge. Most of the stories contained here are worthy of readers attention. If the dark and unknown are things that tantalize you, get Gates of Erebus today. Simply a fun and spooky read. Picture This! Danté Roenik creates ad campaigns, reveling in the fine art of rendering his concepts on million-dollar canvasses financed by big-budget clients. Intoxicated by the sheer power of directing public opinion, he dares wage war against the conglomerate behind a worldwide anti-depressant increasingly associated with sporadic violence. To juxtapose his images with reality, he enlists a mixed palette of business tycoons, his fiancée/attorney, a team of corporate-spy soldiers of fortune, one resurgent news anchor, and the best TV-production crew in Chicago. But the sharp lines dividing perception from truth begin to blur when the darker motives shaping mass media come to light. Forced to re-examine the ethics of designer pharmacology, Danté is painted into a corner, his future about to be erased as patients die, clients lie, and unhealthy doses of murder prove too hard to swallow. Too late to whitewash the stain of deceit, Danté must decide who deserves to appear in his picture, the true subject an unfinished self-portrait way past its own deadline. It’s not what you see, not what you get . . . But all you could ever imagine. Let Danté show you how . . . With a Fantasy Patch! Fantasy Patch by author Stephen Geez is another of the few indie books I really enjoyed. This is the second Geez novel I’ve read. The previous one, while an excellent story, could be a little slow at times. However, this one is all action from the get-go. Geez is a skilled storyteller, to be sure. He’s also brilliant at creating believable characters that really jump off the page. Mr. Geez adds elements from the real world into his story, and makes it seem as if Danté Roenik is somebody we’ve seen on the evening news, exposing the evil deeds of Big Pharma and the corporate empires. If you enjoy action, intrigue, and reality in your stories, get this book. This story follows Ann Rogers from childhood to dysfunctional adulthood and what might have been a promising career following in her late father’s footsteps as a known photographer. Ann began her introduction into the photographic arts as her father’s young model, posing in various states of undress that stirred controversy while garnering her father with notoriety in the art world. However, there are secrets that creep into her adult life that lead her to drugs, kleptomania, and other disastrous choices. The ending left me a little disappointed, but this is an intriguing story. Frank relishes fast success and early retirement–until the monotony turns to boredom and loneliness thrusts him into a desperate struggle to protect the people he cares about most. Beverly thinks moving south will mark a new beginning, but consuming grief steals control of her own destiny and threatens her very survival. All twelve-year-old Kevin wants is attention from a man he can respect, yet tragedy proves even that might never be enough. Together they must discover their own brand of unexpected love, a promise forged in adversity, enduring through loss, and sustaining that infinite potential to achieve more than any one person can alone. Through it all, they’re teased by the mystery of those dancing lights, a million pinpoints in every imaginable color swirling into images of extraordinary lives, their brilliance whispered in the simplest truths as they discover new ways to teach us all. This is one of those stories that grabs the reader from the opening chapter and leads us on a wild ride. A young boy loses his childhood to the darkness of a family life gone askew. A young woman just beginning her journey loses her life in a tragic accident. Enter the mysterious lights that strengthen those left behind. These lights appear to restore those who have been lost. But is this really her? Author Geez touches on some dark issues in this incredible story, including abuse of children and the elderly. But this one doesn’t leave us feeling hopeless or worn down. The writer weaves enough light into the story to keep readers turning the pages in search of the truth about those strange lights. Is there really a way to return from the dead? You’ll have to read it for yourself! The opening pages of Alice Sebold’s follow-up to The Lovely Bones catches a woman killing her Alzheimer’s-stricken mother. This scene sets the pace for the rest of the story, as the curtain is yanked back, exposing severe dysfunction within the family unit. Our POV character attempts to convince herself — and thus convince the reader — that she committed the horrible deed out of love and sympathy for her debilitated mother. We see through this falsehood, recognizing the fact that this character hated her mother. Sebold has a knack for writing strong stories inhabited by interesting characters. And it’s these very characters that drive her stories. If you haven’t tapped into the beauty of Ms. Sebold’s work, get with the program. One of the most acclaimed novels of our time, Wally Lamb’s I Know This Much Is True is a story of alienation and connection, devastation and renewal, at once joyous, heartbreaking, poignant, mystical, and powerfully, profoundly human. Wally Lamb is a great American author telling amazing stories. I’ve been privileged to read a few of his works over the years. This one caught my attention because of the Oprah’s Book Club label. While I’m not a big fan of her former program, Oprah Winfrey sure can pick winners when it comes to books. I Know This Much Is True is one of a dozen or so I’ve read with the OBC designation attached. I’ve not been disappointed. With this tale, Lamb takes on mental illness and twin brothers. His carefully constructed story is tight, deep, and fully developed. This story touches on alienation, religion, family, and reproduction. At 900+ pages, this book is long. But take my word, the journey is worth the time. I recommend pretty much anything from this author.